Like many young boys, Dr. Andy Henry had a lifelong dream of living in a tree house. 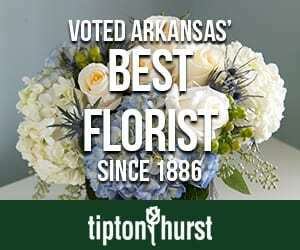 “I started med school in Little Rock in 1979 and finished training in ’85. At some point in that time, I came out to this area and said, I want to live here someday,” he recalls. “Eventually, I found the person who owned the land, bought it, and got my friend from church, Fred Lord, to take a hike with me to see if we could build a house here. He said, ‘I can do it. It won’t be easy, but I can do it,’” Dr. Henry says. It wouldn’t be easy because the property was rugged, undeveloped terrain with a steep slope. 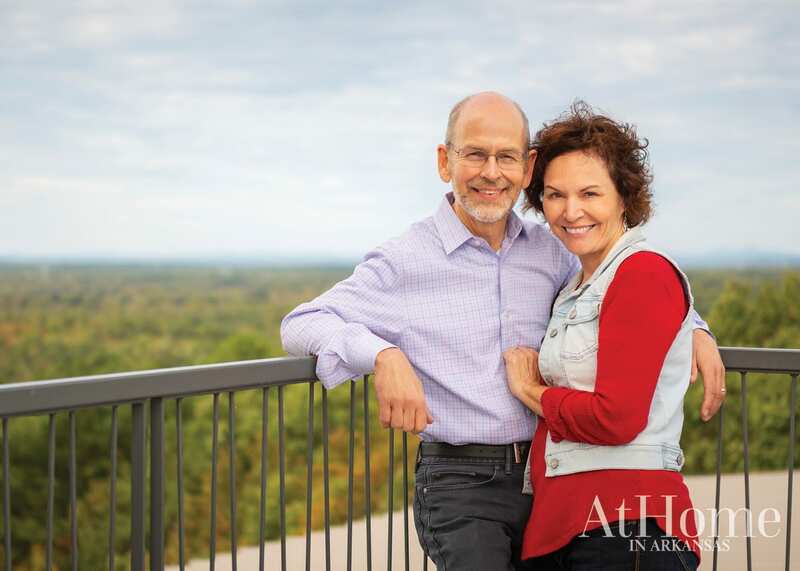 Spurred on by the idea of living in a secluded home that appears to be nestled in the treetops with views of the Ouachita Mountains, Dr. Henry continued his pursuit. Fred recommended bringing in Fennell Purifoy Architects to help with both the siting of the home as well as the desired design; as you may guess, Dr. Henry wanted the aesthetic to mimic a tree house. 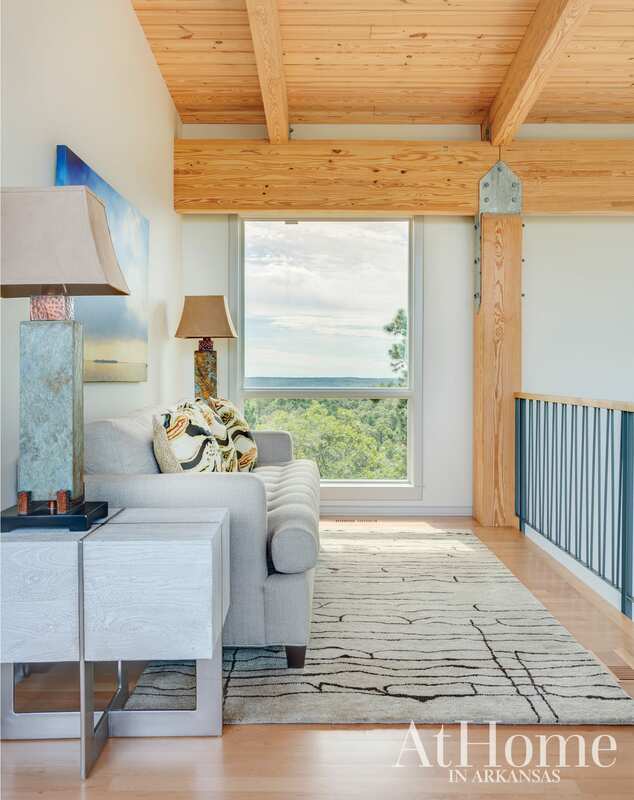 “We looked at the property and chose to situate the house on the higher of its two ridges for an optimal view,” says Phil Purifoy of Fennell Purifoy Architects, who worked on the project along with his colleagues Tom Fennell and Ben Hartter. “I was trying to design a house with a vertical expanse because why live on a mountaintop if you can’t see anything but the tree trunks?” Dr. Henry says. Taking just shy of two years to construct, the modern build consists of poured-onsite concrete, a steel structure, and glue-laminate beams covered in zinc siding. The beams speak to Dr. Henry’s desire to carry the tree house theme throughout, while also bringing the home’s natural setting into its interior. “So, here we are; she’s French country, I’m ultra contemporary, and we needed someone to help us negotiate that water. That’s when Judy called Tom and his team to come and help us,” Dr. Henry says. After meeting with the couple, Tom and his design team knew the home should be comfortable and simple to reflect the pair’s laidback style. “They are both very much into nature and biking and hiking,” Tom says. “Anything that Dr. Henry felt like related to this being a tree house was important to incorporate in the design,” he adds. Wanting to give the home a feeling of warmth, which was rooted in Judy’s love of traditional homes and her previous house’s style, they decided on a warm palette. “Dr. Henry said his favorite time of day there is sunset. 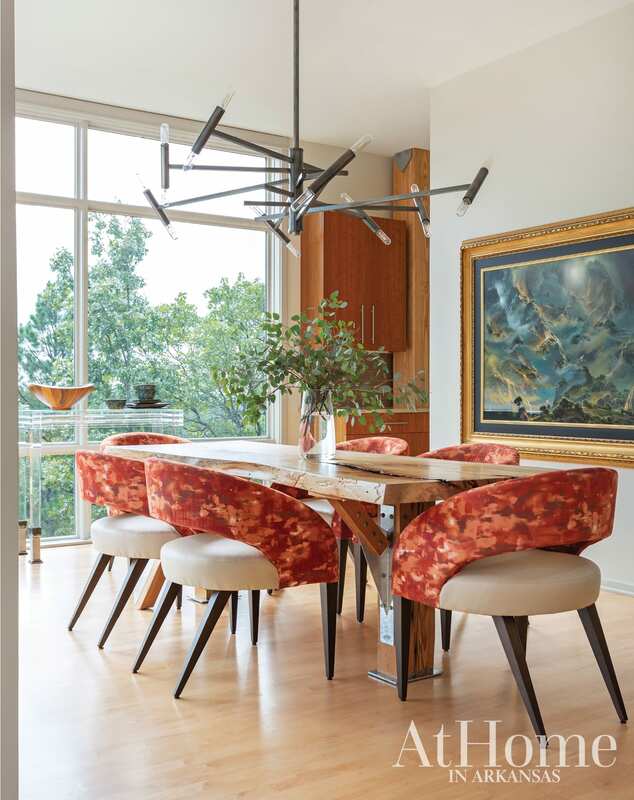 We had a desire to pick up on that in the interior, so those colors drove the palette selection of red, rust, and oranges,” says Martin Potter, a designer on the Tom Chandler team. “Not only did Tom manage to bring both of our tastes together, but it needed to look good in the house as well, and he knocked it out of the park,” Judy says. 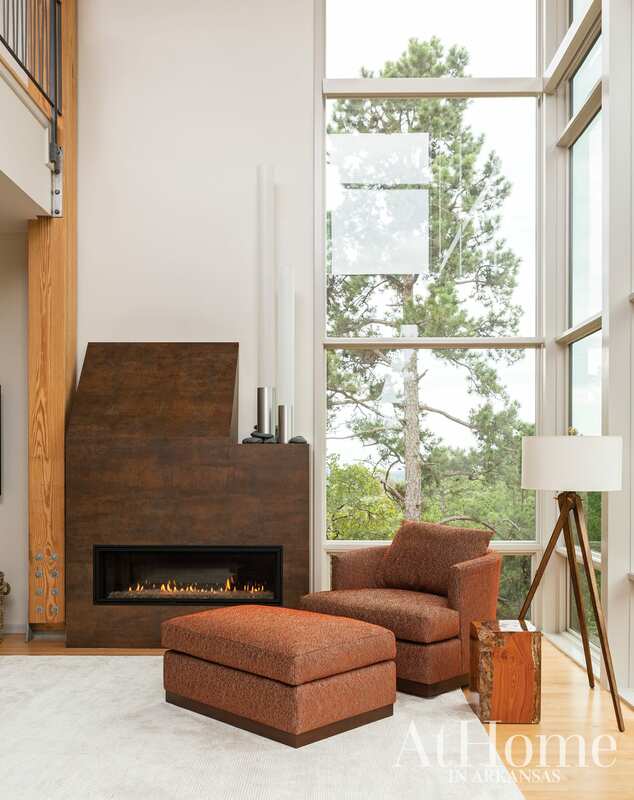 The team at Fennell Purifoy designed the sleek fireplace, which is made of Corten steel that gives the look of a rusted-over-time patina without the mess. Slender light towers from Core iD, seen on the mantel, offer reading light after the sun sets. The upholstered chair has a low back so as not to block the room’s view. “When we started construction there was a wall behind the stove,” Dr. Henry recalls, “and Judy said No, that’s got to go.” Her former home had an open-concept floor plan, and she appreciated the ease of allowing conversation to flow from the kitchen into the living room. 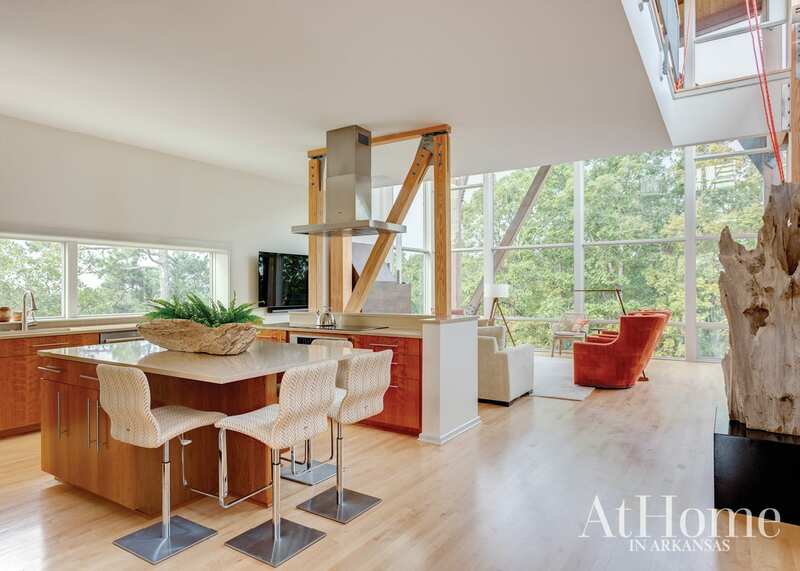 The Fennell Purifoy team selected rich cherry wood cabinetry, which contrasts with the home’s light maple floors. Adjustable-height barstools play to the home’s utilitarian feel without being too stark. An avid tree climber, Dr. Henry has ropes throughout the house, affording him the opportunity to bypass the stairs in favor of climbing to and from the second story. 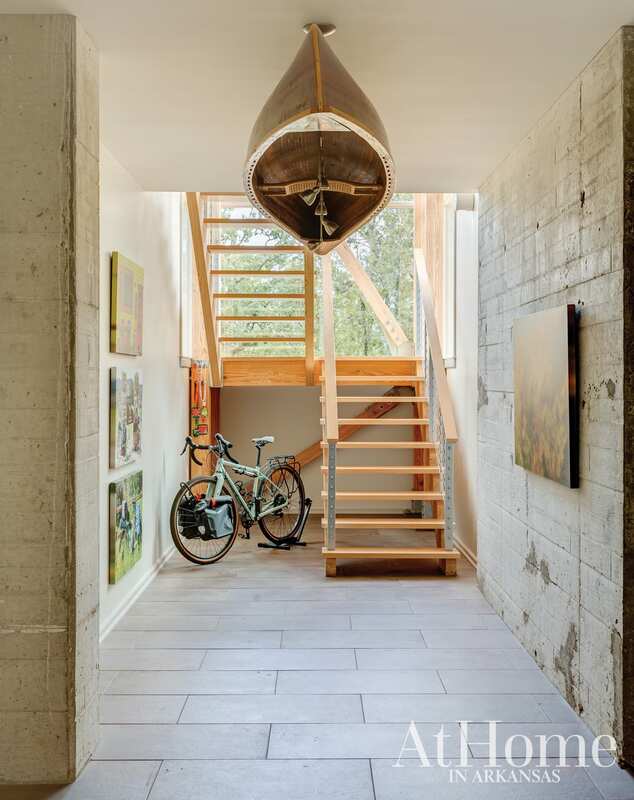 “The original plan was to cover the walls in the foyer,” says Tom, “but the design team talked the Henrys into leaving the raw concrete, and I love how it runs from the exterior to the interior, creating continuity.” An antique canoe was outfitted with track lighting and hung from the ceiling as a nod to the couple’s love of the outdoors, while the bike seen near the stairwell gets frequent use, as biking is one of the Henrys’ favorite pastimes. One of the few pieces the couple brought with them to their new home is a painting by artist Dale Terbush, seen on the wall of the dining room. The chandelier is a custom design, as is the table. “We took careful images and measurements of the house and its steel plates and had the table designed to pick up on that,” Martin says of the piece, which looks as though it emerged alongside the structure itself. The rust-colored chairs are a nod to the home’s palette, which is meant to be reflective of a sunset. Inspired by climbers who sleep on portaledges during extensive treks, Dr. Henry desired to create the same feel in the home’s master bedroom with a platform bed suspended from climbing ropes. 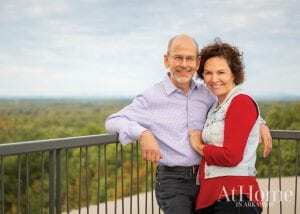 “One of the things I always wanted to do was sleep in the trees, and that’s why we’ve got the bed that swings like we are actually in a tree,” Dr. Henry says. “When I wake up in the morning, all I can see is the treetops.” The platform can also be secured in place to prevent it from swinging side to side. The Tom Chandler team selected a carpet as the artwork behind the bed and tied the textural piece to the outdoors with the addition of a Manzanita branch. 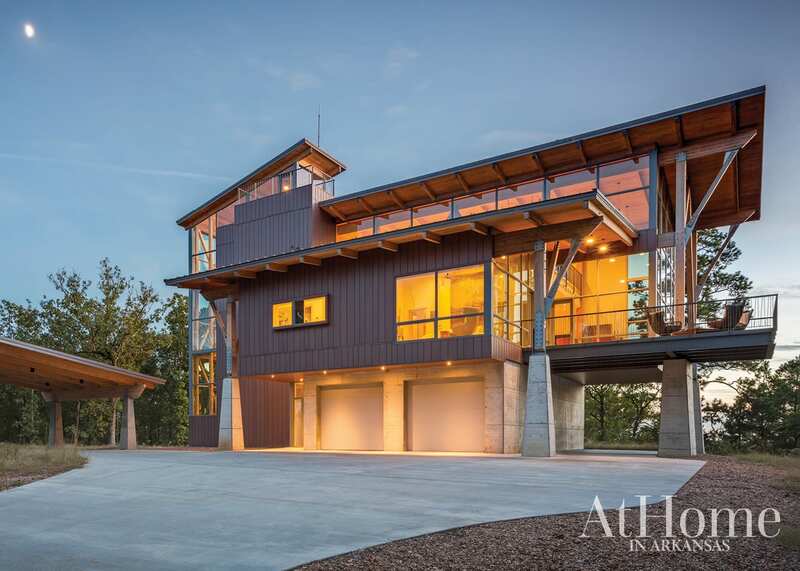 “Rather than enclosing the beams with drywall, everything is exposed to celebrate the structure,” Phil says of the design, which won the American Institute of Architects Arkansas Chapter’s “Members’ Choice” award for favorite project among industry peers as well a merit award. 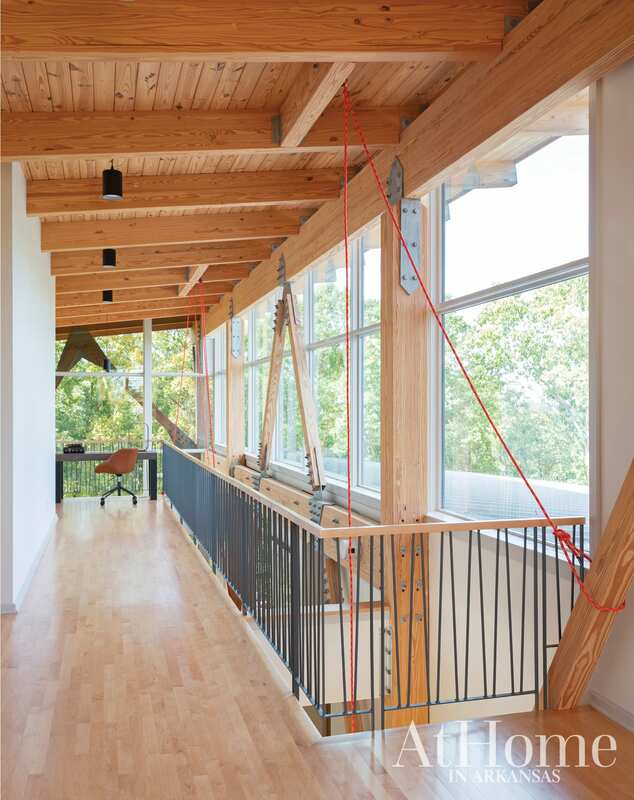 This openness is perhaps most apparent on the second floor, where an extended hallway features a reading nook tucked into one side with views of the structure as well as the exterior.